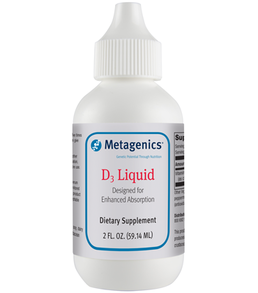 Metagenics Metagenics D3 Liquid 1000 IU 2 oz. https://www.naturescountrystore.com/media/ecom/prodsm/D3_Liquid_large_1.png Designed for Enhanced Absorption Health & Beauty > Health Care > Fitness & Nutrition > Vitamins & Supplements MetagD3Liquid1000IU 22.00 Nature's Country Store new in stock https://www.naturescountrystore.com/Item/MetagenicsD3Liquid1000IU,2 oz. Store Home > Metagenics D3 Liquid 1000 IU 2 oz. Formulated to Exclude: Wheat, gluten, soy, dairy products, egg, nuts, tree nuts, fish, crustacean shellfish, colors, and artificial flavors. Other Ingredients: Medium chain triglycerides, peppermint oil, spearmint oil, rosemary (antioxidant), and ascorbic acid. Caution: If pregnant or nursing, taking other nutritional supplements or taking medication, consult your healthcare practitioner before use. Keep out of the reach of children. This product is Gluten Free.